Jennaphr Frederick joined FOX 29 in October 1999 as a general assignment reporter for the FOX 29 “News at Ten.” Since September 2003, she’s been getting up early with the “Good Day Philadelphia” morning team as she covers breaking news and feature stories around the area. Before joining the FOX 29 family, she worked for two years as an investigative reporter for WKBW-TV, the ABC affiliate in Buffalo, NY. A diverse background has helped Jennaphr to develop a proficiency in news gathering. Before working at WKBW-TV, she was part of the morning team for WTVR-TV in Richmond, VA, a CBS affiliate. She speaks Spanish fluently and takes pride in having worked as an anchor and investigative reporter for KGNS-TV in Laredo, TX, a NBC affiliate and bilingual station. It was there that she started her career and frequently reported stories in Spanish. Jennaphr is a Florida native and a graduate of the State University of New York, Buffalo with a degree in Broadcast Journalism. She lives in Montgomery County, PA, with her husband, Steve, and their two children. During her free time she enjoys snowboarding, golfing, and traveling. 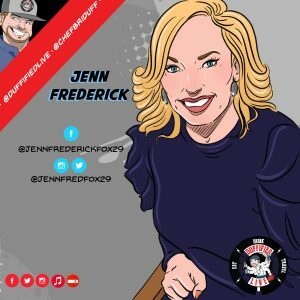 Jenn Fred, as we all like to call her, is a friend, a great mom, and an incredible human being! She and Chef Brian Duffy discuss TV, being a parent, past segments that they’ve done, as well as what it is like to be a fixture in a city where everybody knows you!